Happy Holidays and Merry Christmas if you celebrate! I know there probably aren't many people around on blogs today but I decided to share a festive look with you anyway. 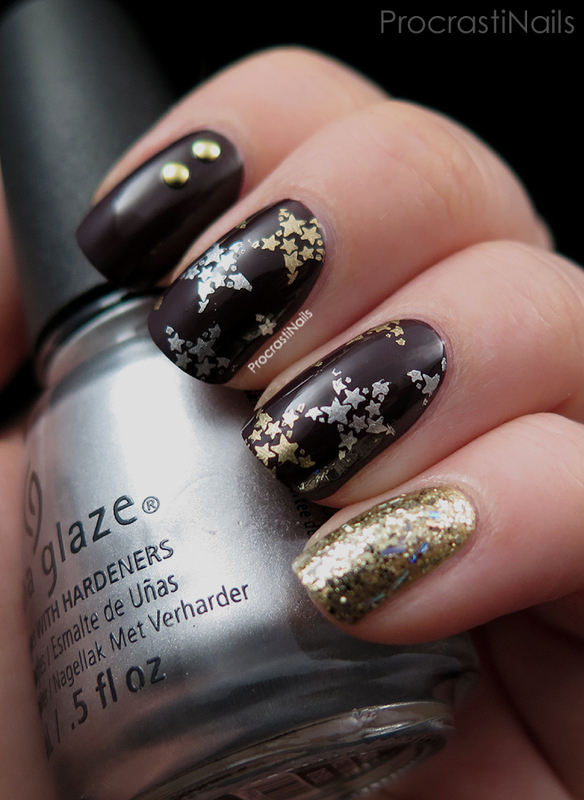 :) I'm wearing a more basic version of this look (no stamping or studs) on my nails to visit my hometown for the holidays but I decided to do a more jazzed up version to share with you because this is a nail blog afterall! We can't have boring! I used a whole bunch of untried polishes to put this look together. My base is a purple-leaning brown from China Glaze's odd (in my opinion) train themed collection: China Glaze What Are You A-Freight Of. I did my accent nail with two coats of Maybelline New York Color Show Bold Gold and then put a dusting of China Glaze De-Light on top for extra sparke. My stamping was done with Cheeky plate CH52, Bold Gold and China Glaze I'd Melt For You (Which I picked up recently specifically because I heard it was an awesome silver stamping polish - they were right!). I thiiiiiiink the studs are originally from a Sally Hansen kit. I think this is such a lovely look. Dark and festive but not in-your-face CHRISTMAS. You know? :) And I'm definitely making I'd Melt For You my go-to silver stamping polish (like my poor almost-empty bottle of Bold Gold is for gold). Yes. Love it! What are you wearing on your nails for the holidays? Any special looks you've put together? I'd love to hear! Those gold and silver stars are pretty! I love this! It would also make a great New Year's Eve mani. 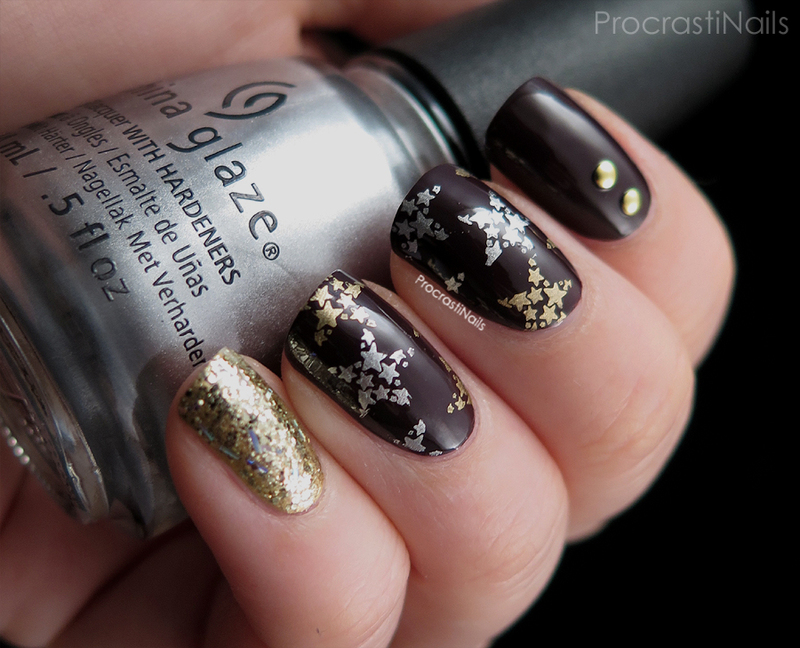 OMG this would be a perfect New Years's Eve mani! Love it! I need that plate! Gorgeous! It's definitely season-appropriate! 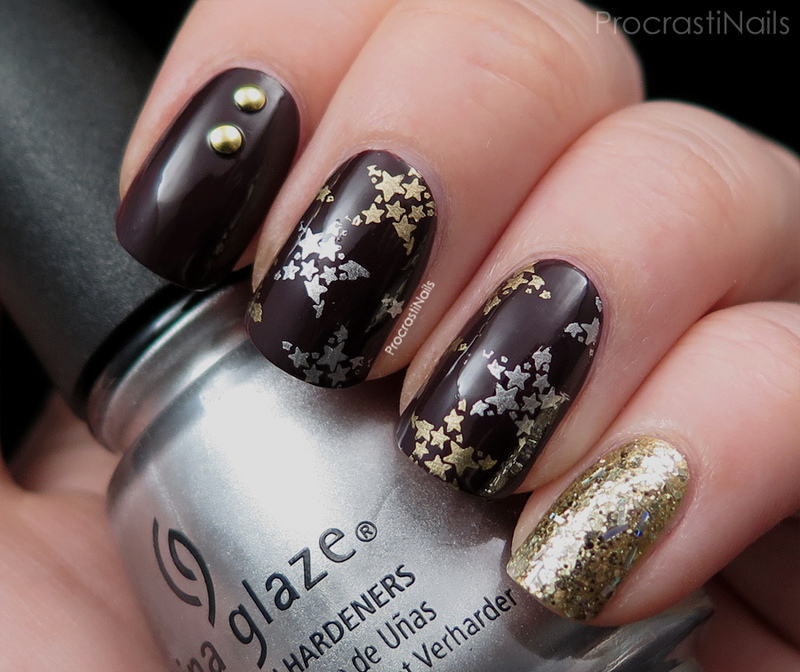 I love the gold glitter accent! I really like the colors in this design. The dark and the metals are a great mix. Really beautiful! This is just stunning! I must get that plate, I love that star design! This is so damn cute! Love it so so much! I haven't had any time to do actual festive looks :( booo! But these look gorgeous, and indeed not over the top at all. This is such an elegant classy look for Christmas! I love those star stamps! stars made up of stars! So lovely! I adore those teeny little stars! How cuteeee! This is beautiful! Its cohesive and edgy while still being delicate. The star stamping is so pretty! I love that you used both gold AND silver!